A decade ago, the U.S. Supreme Court kept the focus on race as a barrier, upholding the right of colleges to make limited use of racial preferences to ensure a diverse student body. But in a ruling due this month, the court is widely expected to roll back that decision. Such an outcome would shift attention more toward a less constitutionally controversial practice: giving a boost to socio-economically disadvantaged students, regardless of race. If that happens, it would reflect more than just a more conservative makeup of the justices. Over the last decade, clogged social mobility and rising economic inequality have shifted the conversation on campuses and in the country as a whole. As a barrier to opportunity, class is getting more attention, while race is fading. "The cultural zeitgeist has changed," said Peter Sacks, author of the book "Tearing Down the Gates: Confronting the Class Divide in American Education." "The Great Recession really exacerbated the vast and growing inequalities between rich and poor in America," he said. "Talking openly about class has been taboo," he added, but in recent years the evidence of widening inequality has mounted and it's become "OK for the so-called 99 percent to talk about the 99 percent." —You can see it in polling, like surveys from the Pew Research Center, which shows the percentage of Americans who feel racial discrimination is the chief impediment to black progress is falling, from 37 percent in 1995 to 23 percent in 2012. Polling on affirmative action varies widely depending on how questions are phrased, but an ABC News/Washington Post poll released Wednesday showed strong feelings about using race in college admissions: Just 22 percent of Americans support letting universities consider applicants' race as a factor, and 76 percent oppose the practice. The proportions supporting racial preferences were similar for blacks (19 percent) and Hispanics (29 percent) as for whites (20 percent). —You can read it in the tone of recent opinion pieces penned even by left-leaning academics and columnists, whose support for racial preferences has eroded under a mountain of evidence that quality higher education is tilting further toward the already-wealthy. —You can hear it, too — in conversations on elite college campuses, where the dearth of low-income students is replacing race as a topic of debate. And in the words of the first black president, who has said there's no good reason his own daughters should benefit from racial preferences when they apply to college. But they acknowledge widening income inequality has made it harder to make their case that special attention to race remains justified. "This is the first time you have whites thinking they face more discrimination than blacks do," said Camille Charles, a sociologist at the University of Pennsylvania who studies class and race. "You have people who have come to believe the system is set up to benefit black people at the expense of white people." Such beliefs, she said, reflect ignorance about the persistence of discrimination, about how much harder minorities were hit by the Great Recession, and about how affirmative action actually works (many incorrectly conflate "affirmative action" with "racial quotas," which the Supreme Court long ago ruled unconstitutional). In his 2010 book "The Moral Consequences of Economic Growth," Harvard economic historian Benjamin Friedman charted how during periods of prosperity, societies throughout history have expanded opportunities to disadvantaged groups and become more open and inclusive. During economic struggle, by contrast, they typically close ranks. The Great Recession was no exception, he said, persuading more Americans that efforts to ensure minorities are represented among the scarce slots at top universities are "a luxury they cannot afford," Friedman said by telephone. A report released Thursday by the Lumina Foundation underscored the large and persistent achievement gaps between races in the United States: Nearly 60 percent of Asian adults have a college degree, compared to 43 percent of whites but just 27 percent of blacks and 19 percent of Hispanics. More alarming are the numbers for those between 25 and 29 — an indicator of recent trends. Whites and Asians are doing better than their parents. Blacks, Hispanics and Native Americans are doing worse. That's a problem for everyone, said Lumina president and CEO Jamie Merisotis. "Narrowing these gaps is a matter of economic and social collective self-interest," he said. But other numbers in the same report revealed how profoundly family income determines how far you go in school: Four-fifths of 24-year-olds from families in the top quarter of income have college degrees, compared to just one in 10 in the bottom quartile. Other research, while calling the black-white degree gap worrisome, concludes the gap measured by class alone is far broader. Students of all races from educated affluent families are seven times more likely to complete a bachelor's degree than students from low-income families with less education (68 percent compared to 9 percent). One study of the freshmen entering the 193 most selective colleges in 2010 found two-thirds came from the top income quartile. Only 15 percent came from the bottom half of the country, income-wise. At the top 20 law schools, another study found, more than three-quarters of students came from the richest income quartile. "We continue to struggle with racial discrimination in this country, but class has become a far larger impediment to a person's life chances than race," said Richard Kahlenberg, a senior fellow at The Century Foundation, and a prominent advocate for replacing race-based affirmative action with class-conscious measures. On college campuses, arguments over race and gender have predominated for decades, but the lack of socio-economic diversity is getting more attention. One sign of the trend is the emergence of a student group called "U/FUSED" (United for Undergraduate Socio-Economic Diversity), with chapters on about 20 prominent campuses. Chapters at campuses like Wesleyan University and Washington University in St. Louis have undertaken a range of efforts, from developing a financial literacy curriculum to lobbying for more financial aid. College students are actually fairly accustomed to talking about race, he said, but class "was something that was under the rug." He said minority groups have been eager to join the conversation, seeing it as complementary to the issues they care about. Kahlenberg, who informally advises the group, said such an organization would have been unthinkable in his own college days during the 1980s. But "the facts on the ground have changed." The test-score gap between blacks and whites, he noted, was once twice as big as the gap between rich and poor students. Now that's flipped and the income gap is twice as big as the racial one. Sackett said he and the group don't necessarily oppose race-based affirmative action; they just want more efforts to deal with socio-economic diversity. Indeed, many people ask, why not do both? Kahlenberg says he's all for that, but "universities never get around to the class part of the equation. They would rather have a class of fairly wealthy students of all races." A big obstacle is cost: By definition low-income students need more financial aid, while race-based preferences don't necessarily go to the neediest students. In fact, research has confirmed large proportions of minority students at selective colleges come from middle- and upper-income families. Kahlenberg believes with some creativity, colleges can use class-based affirmative action to ensure racial diversity. That's happened at many schools in states where affirmative action is already banned. 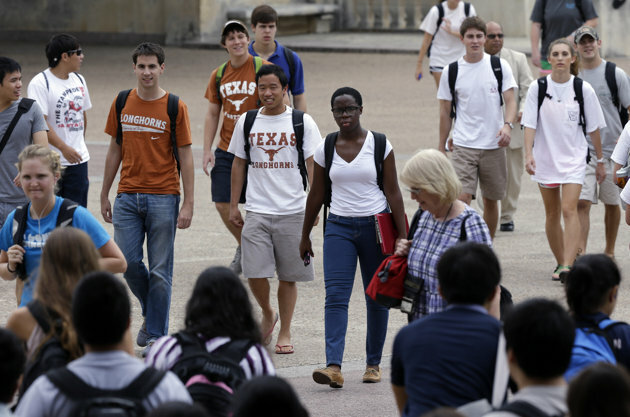 However, the broader consensus is that, at least in the short term and at the most elite schools, replacing race-based preferences with class-based efforts would cause minority enrollment to fall. "Low-income will not replace diversity," said Ted Spencer, admissions director at the University of Michigan, which won the right to use race as an admissions factor in the 2003 Supreme Court case, but later lost it in a voter referendum. Michigan's numbers of minority students have not fully recovered. But Spencer emphasized the court's justification for race-based affirmative action has never been only about minorities, or about rectifying society-wide discrimination, or about pitting racial barriers against class ones. Rather, the court's justification was educational — that all students benefit from a racially diverse student body. Employers increasingly want students accustomed to working with people from different groups, and many students want that experience, too. If the court rules as expected, he's worried they'll have few options. "As we prepare people for work and life," he said, "the absence of diversity on campus deprives all of our students of a very important part of their academic growth."